Wow!!! if ever a time has come for a product, it is now, and this is the product. The EZ Company has made our doggy's lives so much better with their series of collars, leashes and harnesses that fit every job. The EZ Company has designed a collar, leash and harness system that works in harmony. The EZ Collar is designed to slip over the head of the dog. It has a slip down adjuster for a snug fit to the dogs' neck. This collar is for "trained" dogs. That means the dog walks well on a leash. The collar does not prevent the dog from "backing out". This collar is a great alternative to a coupler for two dogs. 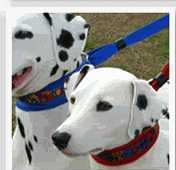 Each dog would then have their own collar but can be coupled with a leash of your choice. The EZ Collar is a wide, nicely padded, beautifully made item that fits the bill for dress up. For those breeds that have neck and throat problems this collar is a must. The EZSwivel Leash pet leash has all of the benefits of the EZLeash™ plus a functional “swivel” mechanism that mitigates tangling of the leash in any situation. The swivel is a sturdy, chrome, case-hardened device that will not rust or tarnish. This leash has a swivel attachment to the clip. I would recommend the Swivel Leash for any dog that twirls and dances on leash. It will keep the leash from becoming like a corkscrew. 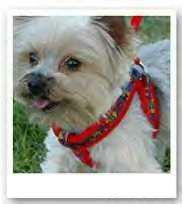 The EZ Harness is a wonderful tool for those dogs that can not tolerate a collar at all. The design is very simple. 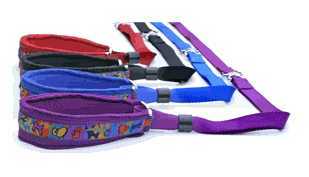 EZ Harness ® is a “step-in” harness, quick and easy to apply, while comfortable and safe for your dog. The EZ Harness TM features double-padded fleece in every component that touches your pet's body, preventing chaffing or injury. You don't have to guess where their feet go. Just lay it out and slip it over the dogs' head, the feet openings just appear. The EZ Harness will always fit properly. It has a slip down adjuster for a snug fit just like the collar. For harnesses the important part is the fit. If the harness is loose it will chafe the dog under the front legs. I use this Harness on my auto immune blind Akita and it's great for puppies too.